Hello! And Happy New Year! I hope 2015 is off to a very good start for you all! I am pleased to introduce the first home♥stitch♥ness pattern release for 2015 - 'Love Blossoms' - a delicate floral heart shaped wreath inspired by the pretty pink and white flowers of the Tea Tree, which is native to both South East Australia and New Zealand (and is a variety in the Myrtle family). The Tea Tree (or 'Mānuka', as it is known in New Zealand) is valued for it's essential oil and the amazing health benefits of pure 'Mānuka Honey' that is naturally produced in New Zealand from the nectar found in Mānuka blossom - hence the option of stitching a sweet little honey bee has been included on this design. Create a beautiful future heirloom to display in your home or give as a gift. The finished design is approximately 4.75" wide x 3.75" high or 12cm wide x 9.5cm high when stitched on the recommended fabric count (16 count aida or 32 count linen) and the finished project fits perfectly in a 5" x 7" photo frame. 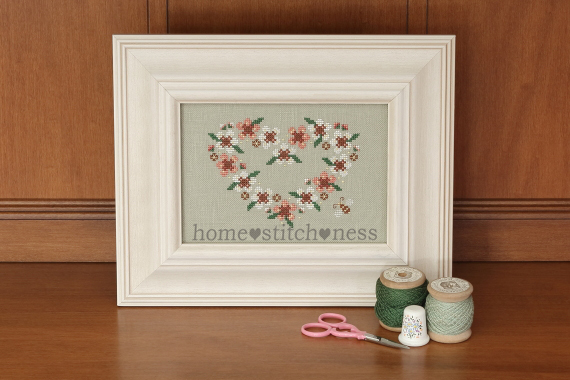 The PDF pattern is available in the home♥stitch♥ness Etsy shop for the special introductory price of NZ $6.00. Oh yay! Thank you so much, Clare!